Prolonging Your Adventure Volleyball Career Through the Appropriately Timed Use of the Word ‘Yes’ (as Well as Smiling, Cooking and Cleaning). The United States of America, Mexico, Cuba, The Dominican Republic, The Cayman Islands, Puerto Rico, Canada, Sweden, Norway, Denmark, France, Spain, Austria, Switzerland, Germany, Italy, Netherlands, India, Slovenia, Slovakia, Croatia, Bosnia and Herzegovina, Montenegro, Turkey, Tunisia, Australia and New Zealand. This short list of beautiful countries represents all of the stamps on my personal Volleyball Passport. I have either coached or played at the professional level in each of these places. I have crossed some other borders too but in those cases, volleyball wasn’t the main goal so they don’t make this list. Since graduating from George Mason University in 2008, I have managed to make my way through more than 25 countries and the majority of the USA solely on volleyball’s ticket. I’ve used a combination of playing and coaching both indoor and beach to fuel this 8 year joyride. However, like most of the players at my level, my number one concern through the years has been balancing my income with training time and travel costs. Somehow, I’ve found a way to make it work despite mediocre finishes across the board. Let’s keep in mind that for most of that time I never had more than 10 grand to my name and I usually hovered somewhere between $1,500 and $4,000. These next facts may be hard to grasp but I didn’t even have a permanent place of residence or a vehicle until 9 months ago. Some people might call me a vagabond but I prefer the title, Adventure V-baller. While I’m not in a position that the average person would consider financially secure, I DO take pride in the fact that I am bursting-at-the-seams rich in experiences, stories, free time, friends and family. My perma-smile goes ear to ear! I’ll take this space to share some tips and a couple anecdotes that might be of some use if you’re interested in the Adventure Volleyball Lifestyle. # 1 – Leave every place in life better off than when you found it. If you want to pursue volleyball full time and you are not one of the top 20 players in the world, you are going to have to cut some financial corners. AKA, get comfortable sleeping on couches instead of hotel beds. The key to sustainability here is getting invited back! There is a very limited number of tolerable, geographically feasible couches for each tournament site. Don’t burn those bridges by leaving a mess! Fold your blankets, put your dirty sheets near the washer machine and reorganize all of those ridiculous throw pillows. While you’re at it, clean the dishes (not just yours) and throw out the garbage. Good deeds and selflessness stick out in people’s minds. Leave their home more beautiful than you found it and your couch surfing host will be stoked to have you back next July! # 3 – Smile! Hosts, potential partners, travel buddies and even tournament organizers tend to enjoy the company of people who are happy. Am I right?! So stay in high spirits, be social and shake hands. Aww, you just lost big? Tough. Now don’t lose out on your next opportunity. Find a way to get out of that funk and rejoin society. I recently got to play a tournament in Austria. The organizers allowed Derek Olson and me to take the ‘Wild Card’ spot because we “have a very California beach volleyball look and sponsors love that.” All it took was an email, a polished up volleyball resume’ and a couple JPEGs! Anyway, we lost bad but that’s not the point. Rather than sulking, we got out to the players’ parties and the dinners and really hit if off with the other players and the organizers. In short, we put on our smiles and we now have an open invite for next year that includes training, accommodations and meals!!! That little notch on my resume’ has gotten me more playing and coaching opportunities than I could have possibly foreseen. In the last 5 years, as part of the beach volleyball vacation company BeachCamp®, I’ve spent 25 weeks living and coaching on all-inclusive resorts while also training against top-level international players. 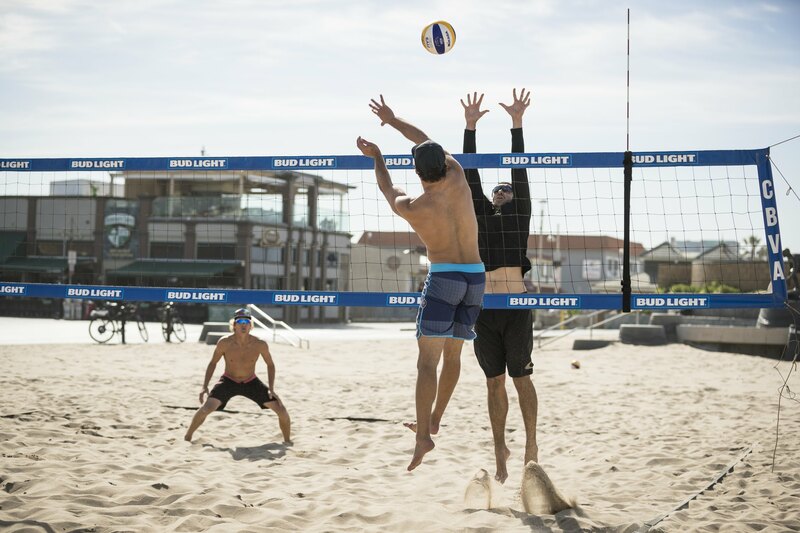 All of this experience led me to starting VolleyCamp Hermosa which provides accommodations and elite training in Hermosa Beach for beach volleyball players from around the world. Now I am the one who gets to play host for anyone looking to take their game to the next level!! REMEMBER! Every time you say ‘YES’ to an opportunity, it leads to more opportunities. Another AVP season has come to an end and with it we have some open ended stories. New stars, family teams, seasoned champs and of course, the grinders. If you missed out on any tournaments last season, don’t make that mistake again. Come out and see the sickest athletes in the country. Play and watch our beautiful sport. Say ‘YES’ to adventures, to volleyball, to growing the game and to The AVP. See you at the beach!